In 1917, my great-grandfather Alfredo Baquerizo Moreno was the first president of Ecuador (in nearly a century of them) to set foot in the Galapagos. Puerto Baquerizo Moreno, the archipelago’s capital, honours his heed. It is safe to say that, at the time of his visit, few Ecuadorians lent the islands much by way of thought, and those who did probably thought of them as little more than a blight on the face of the Pacific. As with so many black legends, their ill-repute was first established following their European “discovery” by Tomás de Berlanga, the Bishop of Panama who almost dying of thirst there in 1535. Nor could the cataclysm wrought upon the worlds of faith and science by Darwin only decades earlier, and initiated by the five weeks that he spent with them, have earned them favour in a markedly Catholic country. Considering that “out of sight, out of mind” is the unspoken dictum of Latin American governance, Baquerizo’s visit to the hinterlands may have struck some as untoward, impolitic, even out of character. While I lay no claim as to what exactly drove my ancestor to San Cristóbal, in a man of such storied good judgement the lure may have been deeper than just checking up on penal colonies and whaling ships –as deep, perhaps, as what had driven Melville out to sea as a young man in a journey that would also take him into the Encantadas, albeit earlier, in 1841. I Iike to think it may have had something to do with his ability as a polymath, a feature that, while not all that uncommon at the time, was certainly unusual in his position: As a trained pianist, poet, translator and novelist who was fluent in several languages and eked out a living out as a legislator before being invited into the morass of South American politics, there must have been some pleasure in discovery involved. It is also probably one reason for the Spaniards to have kept them at the safest possible remove. The Galapagos are a reverse Aeaea in which men are transformed into tortoises and the genius of the place is not a sorceress but a superior mirage. One version claims that Ronald Norris was, like Wyndham Lewis, born in international waters. By other counts, he first deplaned into the world by water, aboard a British ship facing the shoreline of Lobitos. Another, less credible, source, has him born in Lobitos itself, which would have rendered him a native islander regardless, since the township –delimited by signage in English that curtly forbade entrance to dogs and Peruvians— was developed for and by the functionaries of the region’s British oil interests. What’s more certain is this: Ronald Norris was responsible for bringing Lloyd’s reinsurance to Ecuador and, when he first arrived in the Galapagos in 1988, it was to find that most boat owners there did not think to insure their crafts; or rather, that they uniformly felt themselves to be included in the cloaking clause of the angelus novus in charge of climatic (and anticlimactic) affairs. Over time, Norris was able to pick up the slack where the angel left it in gross dereliction of duty, and through all of this pulling and sorting he found himself the head of two families, with another head in San Cristóbal. His six youngest children, who shared in this half-life with him, were soon granted the resident status that was felt to be unglamorous at the time, but that increased in value as soon as it became almost impossible to acquire. Though they have since found purchase in the cities –they, like their father, flicker back and forth between them and the isles— these children are clearly part atoll, part human. Norris kept a delicate entente with the Enchantresses for many years. They would call and he would go to them – some pulls are not to be resisted, but negotiated - but he never committed to staying. He lived in Quito, another intensely volcanic enclave, although far from the sea. It is a matter of concern, however, when a restless animal settles down to sleep after not thoroughly encircling its nest; or when a certain kind of man decides to buy a house. He may have known his time was nigh, since he reported to his wife that this – the island, San Cristobal - was where he had chosen to die. A house is a dead-end street, and the trip that Ronald Norris undertook to buy his was his last. He died at sea, somewhere between the Enchantresses and mainland Ecuador; perhaps in international waters. Only my cousins, his children - for all of them were children at the time - were on board with Norris that day. Six children –his children— sailed his lifeless body back to Guayaquil. He was found, alone, in Pinta Island. It is presumptive to assume he need have been one of a kind. Why not a one-off, just this once? Melville could have entertained the possibility, considering his first Sketch on The Encantadas summoned the “long cherished superstition” of seafarers who thought that – and again, this brings us to Antiaeaea - wicked mariners were turned into giant tortoises, in a spirit not disparate from how the vanguard of Odysseus’ crew was turned to swine. That it didn’t take their fellowmen –known for eating anything under duress— too long to figure out these tortoises were hardy enough to be kept as a living canned good with a full year’s lease on expiration in their travels only ratifies the cogency of Fate. So let’s presume George had been a contender. Perchance he had been someone in the vein of the ambiguously-named William Ambrosia Cowley, a Prospero among pirates who had arrived in the archipelago aboard Cook’s “Bachelor’s Delight”. The year was 1648, and in England, William Petty was inaugurating an important chapter in human rights by vying to profit from invention with his “Declaration Concerning the newly invented Art of Double Writing”. Not all men are made to draw distinctions from very fine differences. Cowley was able to trace and name, not one, not two, but eight of the Galapagos after illustrious colleagues and/or English royals in his turn. But to name is, naturally and unnaturally, to wield authority. Can one be blamed for thinking the Enchantresses may not have had much patience for Cowley’s posturing? Of course, being tortoised is not always punishment enough – some men are suited to a life as reptiles - and these long but finite ordeals are often chock-full with redemptive options. As such, Cowley – now George - was immersed in an oceanic solitude, but with it came the time and pacing from him to embrace the terms of his humiliation. What is a century to sanctity and its attainment? And what is sanctity in the greater scheme of things? Darwin may have been the first man, white or otherwise, to see the islands through their own eyes. This is not to say others had failed to note the facts that would inform his transformative insights: the remark on how “the tortoises differed from the different islands, and that he could with certainty tell from which island any one was brought” was, after all, afforded him by Nicholas Lawson, the Norwegian-born acting governor of the Galapagos at the time of his visit. Nor was it that Darwin was uniquely able to connect the (moving) dots between the different-shellgames-on-different-islands and his mockingbird samplings, since his theory of evolution was famously coeval with Wallace’s. The difference may be Darwin disembarked in Chatham with his mind tuned to the timescale of geology. What first drew his eye was the archipelago’s Brahmanic breathing of - we know it now - more than 20 million years; a sequence of explosive setpieces that predated the appearance of life on Earth and will continue irresistibly beyond it. 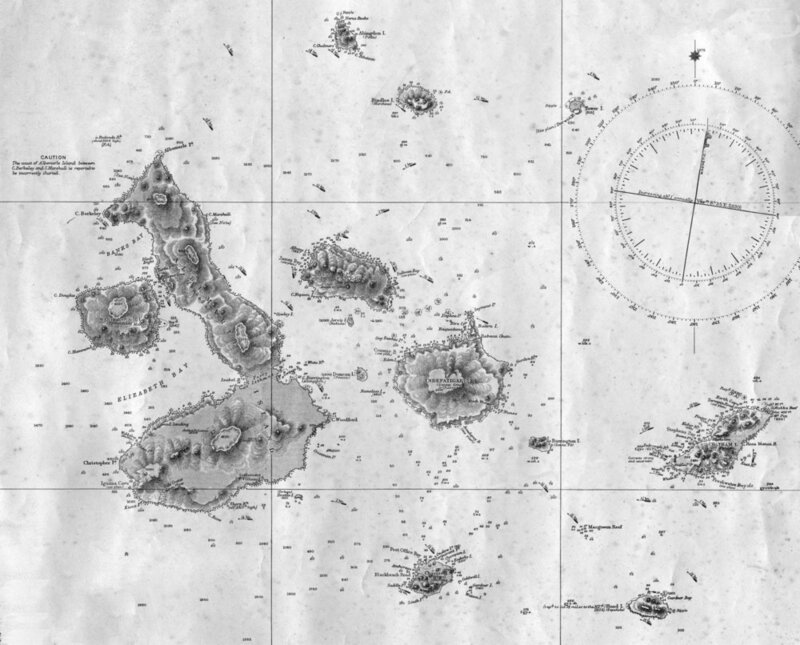 Darwin’s latent predisposition to think from this scale – crystallised in his formidable Geological Observations of the Volcanic Islands of 1844 - was aimed at the conveyance of originality as scientific intuition. The arc of the Galapagos’ inexorable ferment in Darwin has been likened to a conversion and can be traced over some twenty-five years of watchful thinking. It’s earliest symptoms are already consigned in his Galapagos notebook. The first dilations date from shortly after his return to England. In 1859, the year in which Darwin published On the Origin of Species by Means of Natural Selection, or the Preservation of Favoured Races in the Struggle for Life, Alfredo Baquerizo Moreno was born in Guayaquil. * George died in June 2012. Six months later, researchers conclusively identified seventeen tortoises that were partially descended from the same “subspecies” as him. By 2015, the discovery of another species named after George’s caretaker of forty years, Fausto Llerena, was found to have a 90% match to his DNA. Propinquity suggests we may have found the reincarnate William Dampier or some other crewman from the “Bachelor’s Delight”. Mónica Belevan is a Peruvian-Ecuadorian writer with a background in philosophy and architecture. Between 2007 and 2011, she served as the official translator for the Ad Hoc Advisory Committee on Maritime Delimitation that would settle Peru's maritime dispute with Chile in the International Court of Justice at The Hague. She is the editor of www.lapsuslima.com, a member of the editorial board at Hueso húmero and a founding partner at design firm Diacrítica. You can follow her on Instagram or Twitter @lapsuslima. Image: British Admiralty [Public domain], via Wikimedia Commons.